The cardiovascular system pumps blood to every tissue in our bodies through a network of arteries, veins, and capillaries. A key component of any blood vessel is a layer of endothelial cells, called the endothelium, which is the innermost lining of the vessel. 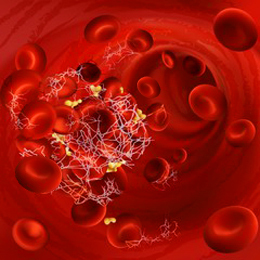 Endothelial cells are critical components of vessels and are in constant contact with the blood. They are involved in angiogenesis (the development of new blood vessels), blood coagulation, fibrinolysis (degradation of blood clots), vessel tone, blood pressure, and inflammation. Given their critical role in vessel homeostasis, when endothelial cells are disrupted, they can also participate in negative effects on the vasculature. In particular, endothelial cell dysfunction is implicated in a number of cardiovascular diseases, including atherosclerosis and hypertension. Lifeline® endothelial cells are optimized for growth in VascuLife® medium, which does not contain antimicrobials or phenol red. Cardiovascular disease is responsible for more human deaths each year than cancer. Well-known risk factors for cardiovascular disease are age, hypertension, and obesity, among others. Another risk factor is the presence of homocysteine, an amino acid that contains sulfhydryl and has a structure similar to cysteine. Importantly, homocysteine can stimulate damaging processes like reactive oxygen species generation and apoptosis. However, the exact mechanism by which homocysteine causes vascular endothelial injury are unclear. To explore the role of long non-coding RNAs (lncRNAs) in homocysteine-induced vascular endothelial cell injury, Li and colleagues treated Lifeline® HUVECs with homocysteine and evaluated its effects on gene expression and lncRNAs. The authors first observed that homocysteine treatment increased apoptosis in Lifeline® HUVECs, but did not affect the cell cycle. Using transcriptome sequencing, they identified 382 differentially expressed genes, 101 of which were upregulated and 281 of which were downregulated following homocysteine treatment. Using bioinformatics, the authors generated a protein-protein interaction network to illustrate the interactions between the differentially expressed genes. The three hub nodes in this network were fibroblast growth factor 2 (FGF2; an angiogenic growth factor), SERPINE1 (a protease inhibitor that inhibits fibrinolysis), and CD34 (a cell adhesion molecule that may enhance vascular repair). The authors also identified 147 differentially regulated lncRNAs, 32 of which were upregulated and 115 of which were downregulated in HUVECs treated with homocysteine. The authors then confirmed the expression of three differentially regulated lncRNAs (AC005550.3, RP11-415D17.3, and RP1-140K8.5) in homocysteine-treated HUVECs by qRT-PCR. Interestingly, these three lncRNAs were predicted to target the three hubs of the protein-protein interaction network: AC005550.3 and RP11-415D17.3 were downregulated following homocysteine treatment and were predicted to target CD34 and FGF2, while RP1-140K8.5 was upregulated following homocysteine treatment and was predicted to target SERPINE1. Together, the results of this study suggest that homocysteine treatment may cause vascular endothelial damage by altering lncRNA expression, which in turn may affect expression of genes involved in angiogenesis and fibrinolysis, two critical endothelial cell functions. Endothelial cells directly contact the blood and as such, they experience fluid shear as blood flows across their surface. This mechanical pressure is known to affect endothelial cell activity, although the cellular mechanisms by which this occurs is not well understood. To investigate how hydrostatic pressure affects FGF2 binding to its endothelial receptor FGFR2, McKenty and colleagues using Lifeline® human microvascular endothelial cells (HMVECs) exposed to hydrostatic pressure. They found that FGF2 binding to HMVECs was significantly greater under 20 mmHg (a physiologically relevant capillary pressure) for 30 minutes than 5 mmHg or 40 mmHg, and was not due to increased expression of FGFR2. To determine whether expression of other growth factors was also altered by pressure, the researchers tested the binding of VEGF-A (another angiogenic growth factor) to HMVECs under 20 mmHg, and found that VEGF-A binding did not change. Together, the results of this pilot study demonstrate that hydrostatic pressure (20 mmHg) increases FGF2 binding to HMVECs, which may in turn, alter endothelial cell behavior. This study also reveals that culture conditions that mimic the physiological environment are important factors to consider when modeling systems in vitro. Visit us every other week here on the blog to learn how researchers use Lifeline® cells to answer their scientific questions. Want to see your study here? Contact us and we may feature your work in a future blog!